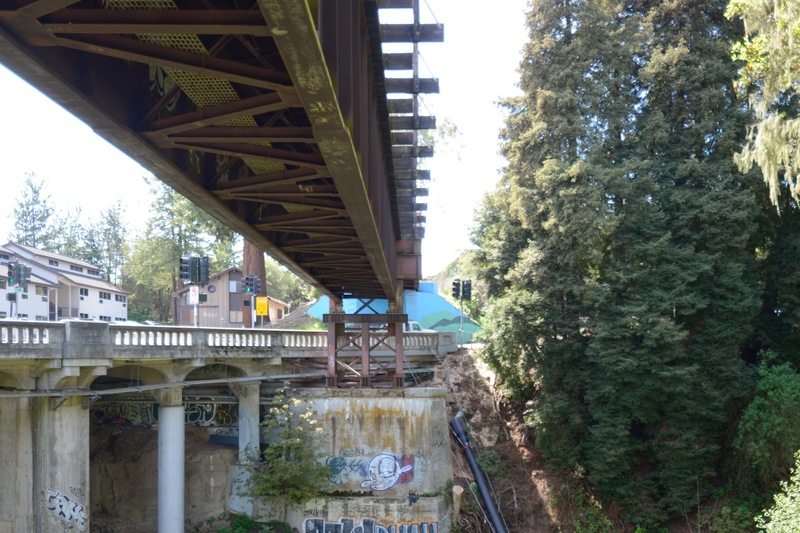 After carefully avoiding roads and rivers east of Capitola, the railroad line abruptly crosses Highway 1, Soquel Drive, and a couple of rivers in a series of complicated, multi-level alignments. Today's Union Pacific Railroad Bridge (36C0077) crosses over Aptos Creek on deep plate girders (supported by steel piers on concrete pier walls). The end span crosses over Soquel Drive on a blue through girder span (see photo below). The design looks so haphazard, that I would have thought it was a temporary arrangement, except that both alignments have been at this site for over 80 years. The span over Soquel Drive is about 70 ft long and the whole alignment (measured on Google earth) is about 240 ft long. Santa Cruz County, California County: Union Pacific Railroad Bridge across Aptos Creek by Mark Yashinsky is licensed under a Creative Commons Attribution-NonCommercial-NoDerivatives 4.0 International License.